This smaller sized board is perfect for cutting and serving a small loaf of bread, but you will find many other uses for it too. 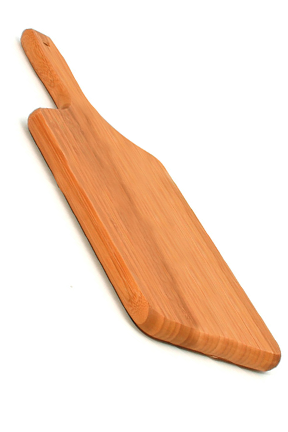 It is a paddle board style cutting board, which is just a fancy way of saying that it has a built in handle. This makes it more suited to serving and moving your food around than a traditional style cutting board would be. It also has a handy hole in that handle, allowing you to hang it up, and always have it conveniently within reach. This high quality paddle board would make an attractive addition to any kitchen, and thanks to high quality raw materials and superior construction, it will last for years to come. It is incredibly useful and versatile thanks to the smaller size and paddle board styling. Use it like a normal cutting board for small tasks, or take advantage of the built in handle to serve food, or carry your chopped veggies across the room. The rich tone of the natural bamboo will retain its look for the life of the board, so you can be sure this cutting board will look like new, several years down the line. Save a tree by choosing an environmentally friendly product that will outperform it's traditional counterpart. Bamboo is 16% harder than maple and lighter than oak. This makes it an ideal choice for everyday use and means knife marks will be less visible, allowing this board to stay in great shape longer. It will absorb very little moisture compared to regular wood boards, and will not shrink or swell when wet. This bamboo paddle board is also incredibly easy to care for. Simply wash with a mild detergent in warm water, and give an occasional wipe with a food grade mineral oil to keep it looking great. Not only does bamboo look great, it is also super strong, long lasting and totally eco-friendly. It is an ideal material for making cutting boards due to it being lightweight yet durable. When compared to traditional cutting boards, this one will last longer and perform better. When compared to similar bamboo cutting boards, you will find that this Swiss designed board is constructed better, and is made from a higher quality raw material. Glass cutting boards will often dull or damage quality kitchen knives, and standard maple or oak cutting boards are prone to nicking and scratching. This can be unsanitary because these small holes can be a breeding ground for bacteria and mold. Since traditional hardwoods don't dry quickly, it encourages further growth after washing. Bamboo cutting boards are naturally antibacterial, as the bamboo is harder than standard wood, and dries quickly to resist mold or food borne bacteria from being trapped within its surface. The result is a healthier kitchen cutting surface. Bamboo is the fastest growing woody plant in the world, but it is classified as a grass and not a tree. For this reason it is able to grow incredibly fast. In fact, when placed in the proper climate certain types of bamboo can grow up to 6ft a day. Unlike most grasses though, bamboo is quite strong and rigid, and when manufactured the right way, can rival the hardest woods for durability. When harvested, 1/3 of the bamboo taken will completely grow back within one year. This makes it incredibly easy on the environment, and a great alternative to traditional hardwoods. Ecologically conscious consumers have consistently ranked bamboo units among the top of their class in the cutting board market. These beautiful cutting boards are handcrafted using flattened strips of bamboo laminated together. A special heating process gives the board it's rich coloring. The natural wood sugars are caramelized under high heat to bring out the deep honey color. Thanks to Swiss design and superior construction, this bamboo cutting board will outlast and outperform similar products. Hand wash. 16.12" x 6" x .62" Order Yours Today! Dimensions 16.12" x 6" x .62"
Swissmar Bamboo Paddle Board - High quality materials and superior craftsmanship make this Swiss made kitchen gadget a must have. A great accessory for anyone that enjoys cooking. Discover the benefits of using a high quality bamboo cutting board. five stars!! exactly what i was looking for! Crispy and Delicious! Make Your Own Potato Chips at Home. Grip Tight And Increase Leverage To Open Any Jar Without Trouble.